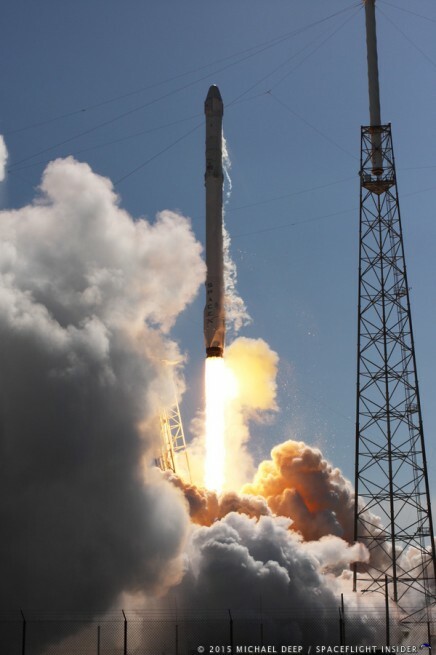 CAPE CANAVERAL, Fla — SpaceX only had one second to get the company’s Falcon 9 v1.1 rocket and Dragon spacecraft off of the launch pad and on its way to the International Space Station – it was all they needed. 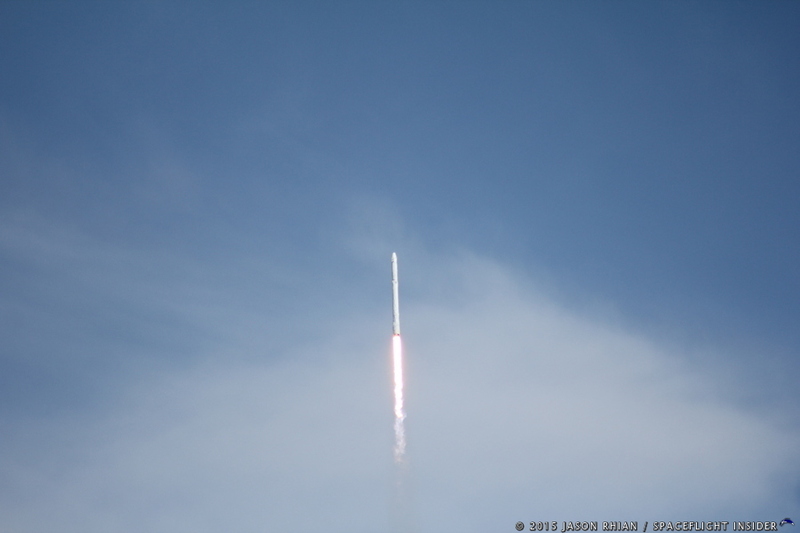 Lifting off promptly at 4:10 p.m. EDT (20:10 GMT), the Falcon 9 roared loudly off of the launch pad at Cape Canaveral Air Force Station’s Space Launch Complex 40 (SLC-40) and into the Florida sky. This afternoon’s launch marked a crucial half-way point in terms of resupply services that SpaceX is supplying under the $1.6 billion Commercial Resupply Services contract that SpaceX has with NASA. Eclipsing this milestone was the next landing attempt for the Falcon 9’s first stage which is supposed to take place after the booster’s first stage completes its mission of sending Dragon to orbit. The launch had been scheduled to take place at 4:33 p.m. EDT on Monday, April 13. However, the turbulent Florida weather intervened causing yesterday’s launch attempt to be scrubbed three minutes prior to launch. 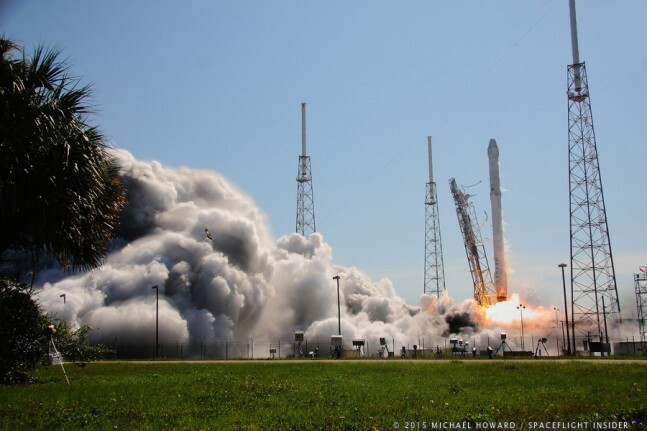 There were no issues that SpaceX worked during the lead up to launch. The Falcon’s nine Merlin 1D engines were deemed ready to get the mission underway by the flight computer that makes the final determination of the booster’s health prior to releasing the 207.8 foot (63.3 meter) tall rocket (when capped by the Dragon spacecraft). This marked the start of a mission that could last a month or so for the uncrewed cargo vessel. 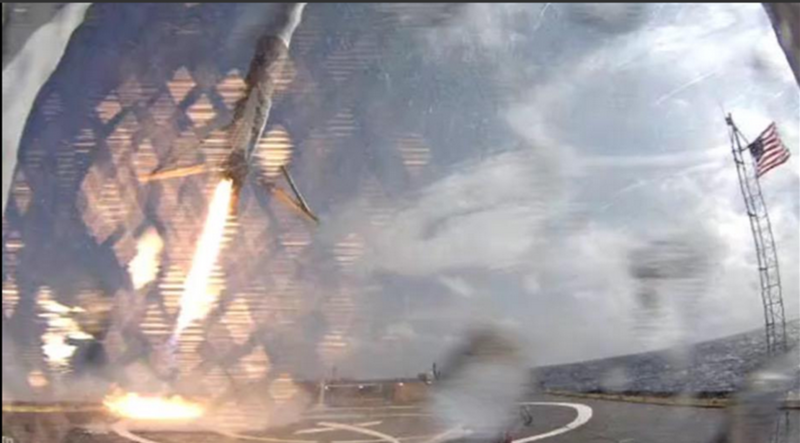 Images posted by Musk clearly show the first stage, landing legs deployed, approaching the ship in preparation for landing. Koenigsmann noted that he had not seen a lot of information regarding the landing attempt – as well as touching on United Launch Alliance’s recent announcement as to having a portion of their new Vulcan, Next Generation Launch System be reusable. This was the sixth operational flight under NASA’s CRS agreement that SpaceX inked with the space agency in December of 2008. In less than three-and-a-half years from entering into the agreement with NASA, SpaceX had accomplished what no other private organization had done at that point – sent a private spacecraft to the orbiting lab. This flight marked the 17th time that SpaceX has launched a Falcon 9 since versions of the rocket began their flights in 2010. The predominance of which, some 16, arcing to orbit from SLC-40 (SpaceX has launched one Falcon 9 from the company’s Vandenberg Air Force Base location as well). The v1.1 version of the Falcon 9 is a two-staged booster that accommodates stretched fuel tanks. The nine Merlin 1D engines in the launch vehicles first stage are no longer arranged in rows of three, rather a single engine is circled by eight others in what has been dubbed the “Octaweb” formation. Ten hours prior to this afternoon’s flight, the Falcon 9 booster was powered up, with the rocket’s highly-refined kerosene propellant (RP-1) being loaded three hours before the planned liftoff time. Roughly two and a half hours before launch, liquid oxygen (LOX), the oxidizer component of the propellant, was loaded into the F9. Gaseous oxygen is vented from the Falcon 9 throughout the countdown, as such, it is necessary to continuously add LOX until liftoff. Approximately an hour and a half before liftoff, tanking of the rocket was completed. 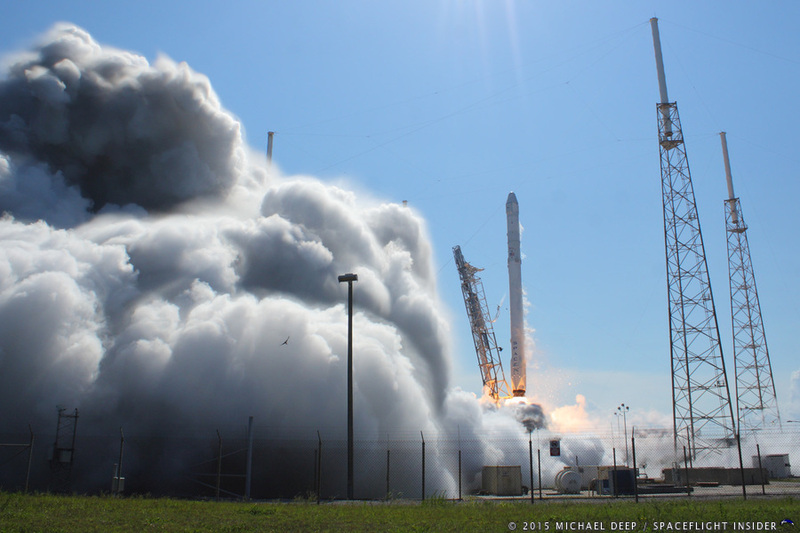 Ten minutes before launch, the Falcon 9’s terminal count auto-sequence began. At this point, launch activities picked up pace, with both the SpaceX Launch Director and U.S. Air Force Range Control Officer providing the final go ahead for launch just two minutes before T-0. At one minute before launch, the flight computer that controls the launch began going through final pre-launch checks. Twenty seconds later, the booster’s flight tanks were at flight pressure. At T-0, a flash of light, followed by a low rumble, announced to the surrounding marshlands that the Dragon had taken flight. This rumble was followed by a piercing scream, one of the tell-tale traits that a Falcon had taken to the skies. As the booster traveled up hill, no notable issues occurred with milestone after milestone falling into place successfully. 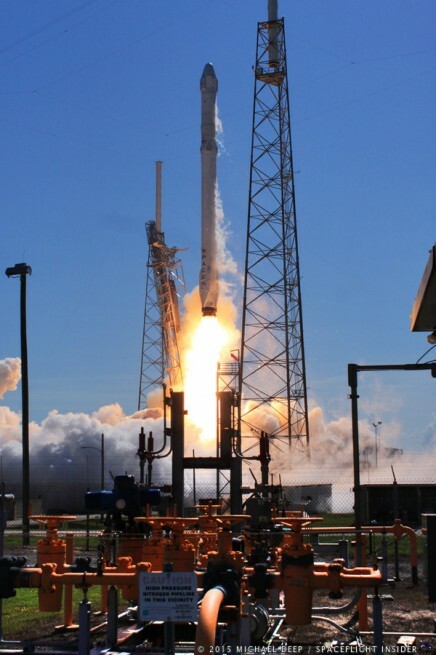 A minute and a half into the flight, both Dragon and Falcon 9 had passed through the portion of the flight known as maximum dynamic pressure or “max Q”. During this period, the vehicle’s speed, along with the pressure from the atmosphere, place rocket and precious cargo through the greatest amount of stress. After taking approximately two days to catch up to the space station, the Expedition 43 crew will grapple the cargo vessel using the Canadarm2 robotic arm and then berth (Dragon does not dock with the ISS) it to the Earth-facing side of the Harmony Module. It should remain attached to the orbiting lab through May 20. After more than a month on orbit, it will be detached from the station and directed by ground controllers to conduct re-entry. Dragon was filled with more than 4,300 lbs (1,950 kg) of supplies and experiments. This included items dedicated to supporting 40 of the more than 250 scientific investigations that will be conducted during both Expeditions 43 and 44. NASA hopes to send crews to a boulder that has been plucked off an asteroid and towed into lunar orbit sometime in the 2020s and then to send crews to Mars in the 2030s. As such, the focus of some of the experiments conducted on station include the following: new ways to possibly counteract the microgravity-induced cell damage seen during spaceflight, the effects of microgravity on the most common cells in bones, gather new insight that could lead to treatments for osteoporosis and muscle wasting conditions, continue studies into astronaut vision changes, and test a new material that could one day be used as a synthetic muscle for robotics explorers of the future. Unlike every other spacecraft that travels to the station, with the exception of the Russian Soyuz, Dragon does not burn up upon re-entry. Rather, it splashes down in the Pacific Ocean off the Coast of California. This provides NASA with the ability to retrieve appreciable amounts of experiments from the ISS. The space agency has lacked this ability since the close of the Space Shuttle era in 2011. This year could be a banner year for SpaceX with two abort tests of the company’s Dragon spacecraft and the maiden flight of the heavy version of the Falcon 9 booster slated to occur in the coming months. SpaceX also has flights scheduled to take place from Vandenberg, something that the firm has only done once before (the CASSIOPE mission, which was launched in September of 2013). I was hoping they would stick this landing, as I’m sure they were, but at least they will have more data to use for the next flight in June. From the brief (edited) video, the rocket seems to have too much speed toward the final approach. You can see the engine gimbaling furiously to try to match the conditions. My best guess is that they will need to increase the target ‘hard deck’ by 50 meters or so and have a ‘check point’ where a stabilization period can be built into the landing procedure. Once the virtual hard deck is reached and the orientation and speed are deemed to be controlled the rocket can then continue to the final stage of landing. 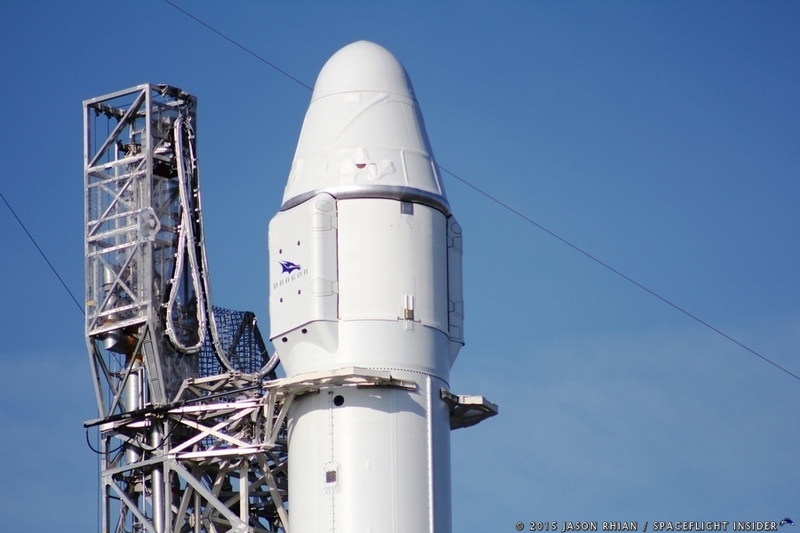 Good luck and looking forward to CRS-7.